This is my idea of a spring soup. I've made use of the local pick-your-own asparagus field in the last few weeks and enjoyed simple dishes of the freshest asparagus. But however fresh it might be, I always have to break off some of the tougher ends of the asparagus spears and throw them in the compost bin. Being in a thrifty (well OK, hard up) frame of mind, I've been saving the asparagus ends this year. I've cut off the really grungy, woody bits and put the rest of the tough but tasty ends into the freezer. After a few asparagus lunches, I had enough for this soup. Asparagus doesn't freeze well, of course, and the texture is ruined, but in a soup that doesn’t really matter. It’s really tempting to add loads of cream to asparagus soup but being in a healthy (well OK, fat) frame of mind I've tried to make this soup a little creamy without the cream. The other twist in the recipe is that I used a little Korean apple vinegar which I bought on a recent trip to New Malden. This is a suburban area on the edge of south (that should really be pronounced 'sarf') London with a large South Korean population. I was supposed to be doing something useful there but as usual I got distracted by the Korean food shops, restaurants and bakery. As you might imagine, apple vinegar is a vinegar but with an apple taste. Cider vinegar will do instead although it doesn't have the same intensity of fruit. Soften the shallot in a little rapeseed oil. Add the vinegar and let it largely evaporate. Add the asparagus and potatoes. Pour over the stock and add the rice. Bring to the boil, cover and simmer gently for about 25 minutes until the vegetables are really tender and the rice is thoroughly cooked. Add the mint and sorrel leaves and a little salt and pepper and continue simmering for another couple of minutes. Take off the heat and allow to cool a little. Liquidise and sieve carefully. Adjust the seasoning. Add a swirl of yoghurt if you fancy or just decorate with some chive petals. 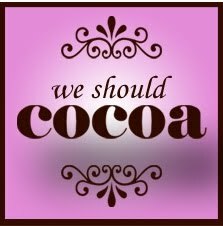 For this month’s We Should Cocoa challenge Chele of Chocolate Teapot has dared us to make a roulade or Swiss roll containing chocolate. I say ‘dared’ because I still find this kind of cake a little scary to make. On the other hand, I love eating them. Generally I don’t mind messing about with recipes even if they’re classics, but I really don’t want to mess around too much with the sponge part of a roulade – that’s just asking for trouble. So this is a classic roulade sponge method. Not original, perhaps, but it works and that’ll do for me. I’ve combined hazelnuts and white chocolate in cakes before in this blog, but it’s a combination that I enjoy a lot and, for some reason, I’m slightly hooked on hazelnuts at the moment. Line a 20 x 30 cm Swiss roll tin with non-stick baking paper and then rub some butter over the paper to make sure that nothing could possibly stick to it. (I think the difficulty with this sponge is the risk of sticking and not the rolling). Preheat the oven to 180°C. Whisk the eggs and caster sugar together thoroughly until they’re very pale and the whisk leaves a definite trail through the mixture. Fold in the hazelnuts and the flour. Pour the mixture into the prepared tin and spread it as evenly as possible. While the sponge is in the oven, cut another sheet of baking paper a little larger than the Swiss roll tin, lay it over a damp tea towel (you may need to weigh down the corners) and sprinkle it with caster sugar. As soon as the sponge is out of the oven, turn it out onto the sugared baking paper and carefully remove the lining paper. Take a deep breath and roll the sponge up (from the narrowest edge) so that the sugared paper is wrapped up inside. Carefully lift the roll onto a cooling rack. Make sure that the tea towel is only very slightly damp and lay it over the rolled sponge. Remove the tea towel after 5 minutes or so but leave the sponge alone until it feels completely cold. To make the filling, melt together the butter and chocolate in a bowl over simmering water. Remove from the heat and stir in the icing sugar and the hazelnut butter. (You could, of course, make your own hazelnut butter if you feel like it, as I did for one of the previous challenges – but I’m just showing off really). Allow the filling to cool completely, then stir in the mascarpone. Put the filling in the fridge until you need it. Unroll the cold sponge and discard the baking paper. Tidy up any ragged edges with a sharp knife (unless you’re feeling very relaxed about the way it looks) and spread the filling evenly over the sponge. Roll the roulade up again being careful not to squidge the filling too much. Dust the roulade with icing sugar and, if you’re not eating it at once, store in the fridge. OK, I know it’s getting a bit late to be posting this but I don’t have the patience to wait until next spring. These sauces will each serve 2 people who are feeling greedy or more than 2, if you happen to know restrained people. Assuming that you can still find some wild garlic, then you can make a wild garlic pesto and very good it’ll be too. But if you happen to be growing radishes and maybe have some sorrel somewhere in the garden then this is a useful, fresh-tasting variation. I hate wasting anything that I’ve grown and making use of the abundant radish leaves has to be good. Make sure all the leaves are fresh and good-looking, of course. Just whiz all the ingredients together in a processor with some salt and pepper, adding as much oil as needed to make a sauce that’s as loose as you like it. I think that using a mixture of both oils complements the flavour of the leaves best. Stir the pesto into your chosen pasta, although it will also work well as a sauce to drizzle over soft cheeses or chicken or whatever you fancy. Alternatively, if you fancy a tomato-based sauce or if you don’t have a large number of leaves available, then this is a sweet and sour sauce with the wild garlic adding a strong savoury note. The finished sauce really doesn’t have an overly strong taste of garlic. Gently soften the onion in a little olive oil. After ten minutes or so, add the marsala and the balsamic vinegar. Increase the heat and reduce the liquid in the pan by half. Stir in the wild garlic leaves and continue to cook over a medium heat for 3 or 4 minutes. Add the passata and the sugar. Cook gently for another 15 minutes or so until the mixture has thickened somewhat. Add salt and a generous amount of pepper. You might find that the sauce needs a little more sugar as well. Serve with your chosen pasta and a sprinkling of parmesan. 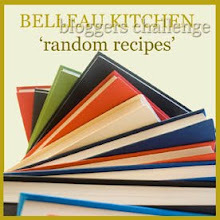 For this month’s Random Recipe challenge Dom of Belleau Kitchen has asked us to come up with desserts and to pick a random recipe from one of our cookbooks dedicated to desserts, cakes or puddings. I suppose it just proves that I like more general cookbooks, but after a quick search through the bookshelves I found only one such book: “The National Trust Book of Traditional Puddings” by Sara Paston-Williams, published in the eighties. (Although this particular book is now out of print the National Trust currently sell several books that cover much the same ground and seem to be derived largely from this original collection of recipes). There were two recipes on the randomly chosen page in the book: I could have selected a roly-poly pudding, but who could turn down the opportunity to make something called Hollygog pudding? The original recipe comes from Kiddington in Oxfordshire and, in fact, it is a kind of roly-poly pudding filled with golden syrup and cooked in milk. Not the sort of dish I make very often and maybe a little more suited to midwinter than spring, but it’s old-fashioned, unashamed comfort food. And that can’t be bad. Sieve the flour and salt into a mixing bowl and rub the butter or lard into the flour until the mixture resembles breadcrumbs. Add enough of the water to form a stiff dough. Roll out on a floured surface into a rectangular strip. (Don’t try to make it too thin or it will start to break up). Spread with the golden syrup and roll up like a Swiss roll. Put into a buttered ovenproof dish and pour in enough milk to come about halfway up the side of the pudding. Bake at 200°C for 30-45 minutes. The pastry should have taken on a light golden colour and much of the milk will have disappeared. Cut the roll into slices and serve hot with plenty of custard or cream and maybe a little drizzle of yet more golden syrup. I know that there are plenty of other versions of this recipe around, but this is how I make it and, believe me, it’s really easy and very yummy. You do need some time, though, so it’s a good recipe for lazier days when you’re hanging around the kitchen doing something else. I use the confiture in a large number of desserts but just drizzled over ice cream with pears or bananas remains a firm favourite. If you want to use it for pouring or drizzling rather than spreading, then simply stop the cooking process before it gets too thick. The bicarbonate of soda in this recipe seems a little odd but seems to improve the final result, presumably by adjusting the acidity. Anyway, someone from Normandy told me to put it in and I reckon he knows a lot more about it than I do. What’s the difference between confiture de lait and dulce de leche? I was told that real dulce de leche doesn’t contain vanilla or bicarbonate of soda, but I recently bought an apparently authentic imported jar of dulce de leche and it contains both. So damned if I know the difference. Depending on how thick you make it, this recipe should produce around 500 – 600ml of confiture. Place the milk, sugar and bicarbonate of soda into a large saucepan. Bring the mixture to the boil while stirring a lot to ensure the sugar has dissolved. As soon as boiling point is reached, lower the heat and skim some of the foam from the top (there’s no need to get it all). For the remainder of the cooking period the mixture should be barely simmering: the surface of the liquid should be trembling with maybe the occasional bubble. The mixture will need to cook gently in this way for at least 2 and probably more like 2½ hours. Throughout this time, you need to keep stirring regularly and check that the liquid is not simmering too actively. Towards the end of this period, the cooking will seem to speed up, so stir more often and keep a careful eye on it. When it’s ready, the mixture will have darkened and thickened somewhat. As it cools, the confiture will thicken a little more, so take the saucepan off the heat when you think the mixture is still a little too thin. Whisk in the vanilla paste as soon as the pan is off the heat. Allow to cool a little, pour into a clean container or sterilised jars and store in the fridge. Not sure how long this will keep, because it seems to get eaten too quickly to find out.